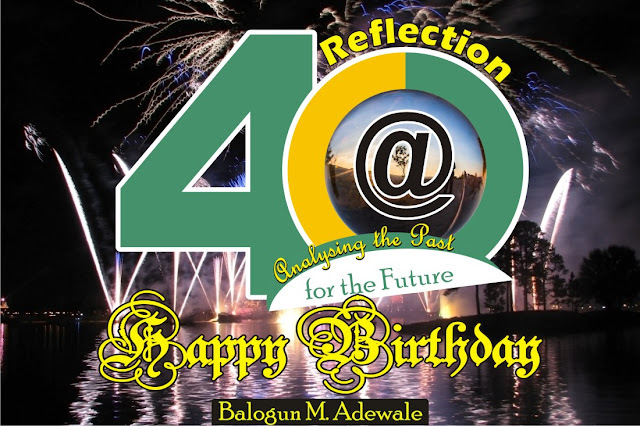 Today, I clock 40, its a significant day in my life related to a lot of things. I've being looking forward for this day with a lot of plan, but other reasonable plan makes me shell lots of the plan towards today. Its all for good. One of my plan towards this day is to write a brief autobiography book titled; Reflection: Analyzing the Past for Future Plan. But I could not finish it up till today. But I never give up, While I will still produce it in book, I thought of sharing it here chapter by chapter until I finished up. Sincerely speaking, we all have one story or another in our life that could light up someone's world. My is not an exception. I am very sure you will enjoy this. It's not about a huge achievement, because I have not being fortunate to make it big and hold it for a long time. But I can assured you, you will find this interesting and have something to take home. The reason I consider this special is because, to me, it's an end to one stage of my life and an opening of new one. You will find out later, if you follow me chapter by chapter. I will be doing this weekly. I don't have a mentor. If I am fortunate to have someone who either accidentally or intentionally mentor me instead of me learning by try and error, I am sure my story would have take a different and likely a better shape. After finishing my secondary education in 1996, while almost all my mates are thinking of temporary job, I was thinking about a little business I could start coupled with farming and fishing activities (I was raise is a little village where major economic activities is farming and fishing). So, I started selling kerosene. This was the first knowledge of attraction that I encountered. My business acumen attracted a better business. A man came to our village trying to see if he can get a trustworthy person that will be helping him purchase coconut from farms and supply him in the major market. He was directed to me and that is how I hit my first major business deal that year. In almost 3 years, I was well know as a coconut dealer until I secured admission to study finance. I stop the business for schooling (so unfortunate). If I can turn back the hands of time, I would have continue the business while I choose part time schooling rather than the full time. That is where mentoring is very important. But all the same, from the try and error approach, I learnt a lot worth sharing without which might not be possible. Be my guest as I share the story of my journey till I rich 40, analyzing my past to make a better decision for my future.